IELTS Express is a two-level preparation course for students at intermediate (4 - 5.5) and Upper Intermediate (5.5 - 7) levels. The Upper Intermediate level is aimed at an IELTS score of 5.5. - 7 IELTS-type tasks and focuses exclusively on preparing learners for the Academic module. Extensive support materials are available for both the student and the teacher. 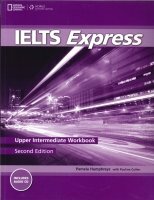 Each IELTS Express Coursebook is an ideal choice for short preparation courses of 30-40 hours, and can easily fe extended for longer courses by selecting from supplementary materials. This popular IELTS preparation course has been completely revised. The Student's Book has been redesigned and almost all of the photographs, graphs and charts have been replaced. All of the reading and listening texts have been updated or are new.